With the socket type mount design EPM 9800 meter is perfect for industrial and utility substation automation applications where both power quality monitoring and revenue accuracy are required. 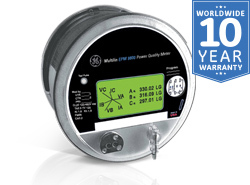 EPM 9800 provides most accurate analysis of electric power and energy. Using advanced DSP technology meter measures instant and stored revenue power data. Meter includes all the attributes required for highest level of PQ analysis and communication. From today's utility giants to large industrial users to local electrical municipal, an effective energy management and power-monitoring program is critical for success. The EPM 9800 is an advanced monitoring product, providing the total picture of power usage and power quality for any metered point within a power distribution network allowing users to make power related decisions quickly and effectively. With its web server capability, EPM 9800 can be monitored anytime and from anywhere via the Internet. EPM 9800 is simple to use and easy to set up.